Dairy farmers Douglas and Mary Jane Burdick had recently joined the federal government's Dairy Termination Program ("DTP"), a Congressional effort to increase dairy prices by restoring market equilibrium through what amounted to a generous severance package. DTP participants agreed to discontinue milk production and stop acquiring dairy cattle for a period of five years (a prelude to a final exit from the dairy business). 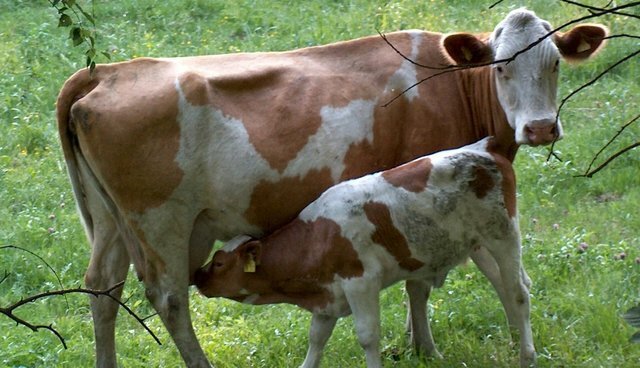 As a condition of acceptance into the DTP, however, the USDA issued Notice LD-249, imposing a 15-day deadline to ensure that, "All female dairy cattle [will] be branded with a hot branding iron. Freeze, chemical, or other branding methods are not acceptable." On the testimony before me, the hot-iron face branding of cows appears to constitute a violation of the state anti-cruelty laws which the Humane Society is sworn to prevent. In addition, by branding their cows, the Burdicks would expose themselves to prosecution for violation of New York Agriculture and Markets Law § 353. Even more important is the prospect of not qualifying for the program if they fail to brand their cows within 15 days of acceptance. Membership in the program is limited to those applicants accepted as of April 1, 1986. Decided nearly thirty years ago, at a time when the legislative attitude toward animal cruelty would be best described as anemic, Telesca accusatorily wrote, "Most importantly, if cruelty to animals were indeed a consideration, LD-249 would not be drafted the way it is." Since Lyng, some businesses continue to see animal cruelty as economically advantageous, thanks in large part to recent legislative efforts to close the curtains to eyes of not only the consumers but also competitors pushed out of the market because they refuse to let profit interfere with compassion, those who do not view animals as purely units of production. A business model striving for economies of scale by embracing a mechanistic view of animals is incompatible with, and inimical to, animal welfare. Indeed, the approach inevitably becomes diseconomic. Neglectful, restrictive, and anxiety-producing conditions reduce productivity, often in the form of herd disease and increased mortality. At this point, industry resorts to the use of subclinical antibiotics as a prophylactic measure to counter the abusive conditions in which they force the animals to wallow. And in so doing, a vigorous debate has picked up steam not only on the role of such countermeasures in the creation of antibiotic-resistant superbugs and their harm to human health, but also the widespread environmental impacts of concentrated animal feedlot operations, and the wisdom of switching to plant-based diets. As the public learns more about the origins of the meals on their plates, a care ethic has taken its rightful place among the other traditional consumer considerations like price, taste, quality, and variety. One would think the government would listen to its constituencies. Yet instead of arresting the proliferation of animal abuses at farmed animal operations or phasing out practices that European farmers abandoned years ago - and what the Pew Commission on Industrial Farm Animal Production said in its 2008 examination of American farmed animal practices "prevent the animal from a normal range of movement and constitute inhumane treatment" (speaking of veal crates, hog gestation pens, restrictive farrowing crates, and battery cages for all poultry) - States are feverishly attempting to enact laws that not only obscure what happens to farmed animals, but criminally target those who seek to bring such patent cruelties to light. One such law punishes those who record animal abuse at an agricultural operation without consent of the farmer and do not turn over those recordings to law enforcement within 24 hours of recording. This serves the industry's transparent agenda to out undercover investigators, chill newsgathering efforts, and prevent the public and government agencies from knowing risks to consumer, occupational, environmental, and animal health and safety. To be clear, these recordings leave the abuser dead to rights. Without them, prosecutors would rarely be able to make stick animal cruelty charges. It should strike the reader as oddly coincidental that the day the fifth Butterball employee pled guilty to animal cruelty – charges brought because of an undercover video showing workers stomping and kicking birds, throwing them by the necks into metal cages, and beating them with metal bars – the North Carolina Senate introduced the Commerce Protection Act – i.e., a law that, in part, created the crime of "employment fraud," which would have the practical effect of ensuring that such videos would never again see the light of day. Such a law also would have prevented the 2012 animal cruelty charges brought by Twin Falls County Prosecutor Grant Loebs against three workers at Bettencourt Dairies' Hansen facility. And this is precisely what proponents of Idaho Senate Bill 1298 appear to want. This new bill criminalizes merely entering an agricultural production facility and making audio or video recordings of even the most heinous acts of animal cruelty if done "without the facility owner's express consent or pursuant to judicial process or statutory authorization." Proposed Section 18-7042(1)(d). Given what society takes from them from the cradle-to-slaughter process - their skins, organs, muscles, bones, and labor - one must question why industry needs any law to deter, much less punish, those who record undisputed, heinous, and universally-objectionable acts involving the brutalization of animals? If everyone agrees on what the video depicts, then why not focus on the perpetrator rather than the whistleblower? Why only permit amnesty to the videographer if he delivers a copy to law enforcement within one day but offer no refuge in two – where prosecutors could charge animal cruelty one or two years after the act? Why make it a crime to capture images of criminal activity at the workplace, when that activity creates a hostile and illicit work environment for an employee who is striving to make a living to support a family (while at the same time showing compassion to the animals with whom he works), but not to make it a crime for that same person to share, verbally or in writing, what he observed? And why create a mandatory reporting law for the employee but not the employer? No trade secrets or proprietary information risk being exposed, unless industry implements abusive protocols as a cost-saving measure to outperform and compete against more conscientious competitors. Instead of getting ahead of the issue by promoting transparent operations and honoring what the public holds dear – viz., treating animals humanely – industries fuel the fox-guarding-the-henhouse image, spawning deep suspicion and rising consumer diffidence. They do so despite several economic indicators warning that animal cruelty is bad business. For instance, mega-corporations like McDonald's realized this, dropping Sparboe Farms after Mercy for Animals showed horrific acts of cruelty – more commonplace than anyone in industry cares to admit – at five facilities in Iowa, Minnesota, and Colorado. Target Corp. followed suit, pulling their eggs off its shelves. Not wanting to be left out, on Apr. 25, 2012, Burger King Corp. pledged 100% cage free eggs by 2017 and elimination of gestation crates for breeding pigs. Dozens of other restaurants have made similar game-changing moves of McDonald's Corp. to require its pork suppliers to eliminate gestation crates. In addition to pressure from below (consumer), industry has seen recent challenges from within (its own shareholders). In 2009, HSUS filed SEC and FTC complaints against IHOP and DineEquity, Inc. for making misleading claims that it served "cruelty-free" food per "dignified, humane" animal care standards. And in 2011, the SEC overruled Columbus, Ohio-based restaurant chain Bob Evans's petition to block HSUS's proposal encouraging a phase-in of cage-free eggs in the company's 2011 proxy materials. There is only one thing worse than animal mistreatment. That is using misleading advertising to make consumers believe they are buying products not sullied by such mistreatment. In the race to court the more conscientious consumer, akin to efforts of contractors to boast "LEED-certified" and orchardists "100% organic," most American egg producers labeled their cartons "Animal Care Certified." This empty (and misleading) sloganism resulted in a Sept. 30, 2005 announcement by the Federal Trade Commission that the United Egg Producers' logo would, by consent, be removed nationwide in 2006 and replaced with a revised "United Egg Producers Certified" seal. That same year, UEP paid a $100,000 fine to settle false advertising claims by 16 state attorney general offices and the D.C. attorney general. Take the 2009 Westland/Hallmark False Claims Act lawsuit brought by HSUS and resulting in the largest beef recall in history. Belied by undercover video showing the abuse and slaughter of downed cows, a half-billion dollar settlement and bankruptcy followed accusations that the California slaughterhouse defrauded the federal government's school lunch program by signing contracts promising humane treatment of animals. Purple (the ribbon color associated with animal welfare, and over a dozen other causes) is the new green. One can no longer deny the extent to which nonhuman animals have become stakeholders in commercial dialogue. Thousands of years ago, revered texts of the world's religions and philosophies endorsed benevolence toward animals. Recall the heart-rending tales of individuals such as 34-year-old nurse Valerie Bennett, who futilely begged Hurricane Katrina rescuers to take her wedding ring and her mother's wedding ring to ensure her dogs' safe passage from a New Orleans hospital. Consider that years after this tragedy, 63% of Californians voted to pass Prop 2, the Prevention of Farm Animal Cruelty Act, forcing elimination of veal crates, battery cages, and sow gestation crates by 2015. Even in a conservative, pro-agriculture state like Idaho, Boise-based Pets Best has sold policies that stem animal cruelty in marketing its pet insurance by not covering injuries resulting from animal fighting and barring claims from intentional harm to an animal by the insured, insured's family member, or resident of the insured's household. Crop farmers stand to make the greatest long-term gains in a society increasingly hostile to CAFOs, health-conscious, and animal welfare-oriented. This means targeting vegetarians and vegans as the largest growing market segment in America (increasing 20% in the last decade to 6% in 2010), and those who sell to them. Joining the ranks of the Power Vegans (to quote Business Week's Nov. 4, 2010 article) are multi-billionaire Steve Wynn (who issued a mandate for vegan menus at all of his restaurants in the Encore and Wynn Las Vegas resorts), Whole Foods CEO John Mackey, Ford Exec. Chairman Bill Ford, Twitter co-founder Biz Stone, Mike Tyson, and former U.S. President Bill Clinton. Soy, almond, hemp, and coconut producers have begun successfully reconstituting public perceptions of dairy, yogurt, and ice cream with better-tasting, far healthier, and indubitably cruelty-free products than their animal-sourced counterparts. The message is clear: business must embrace, not oppose, animal welfare. Idaho's SB 1298 and similar legislation, coupled with arrests of those like Utahan Amy Meyer, only fuels societal distrust of the ag industry. Such tactics will inevitably lead to an industry crippling, ethically-driven consumer embargo and litigation on the civil and criminal fronts unlike anything seen to date. Adam P. Karp is a founding board member of the Animal History Museum.He practices animal law throughout the States of Idaho, Washington, and Oregon, teaches animal law at two law schools, founded the Idaho State Bar Association's Animal Law Practice Section, and received the Excellence in the Advancement of Animal Law award in 2012 from the American Bar Association's Tort Trial and Insurance Practice Section.